Hydroussa, Exfantis, Tzia, Kea, Keos. This island has changed its name so many times even the locals themselves have lost the count. 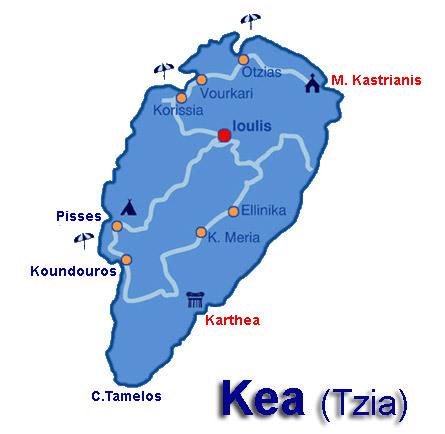 Currently, its official name is Kea but everyone refers to it as Tzia, so you can call it the name you think sounds better. It doesn't really matter, does it? I prefer to call it Tzia. It just sounds better than Kea, I don't know why. So, Tzia, frozen in majestic silence, is a beautiful island quite popular with Athenians because it's close to the mainland. Unfortunately, when I decided to go there my friends and I were too young, so they all prefered the big names:. 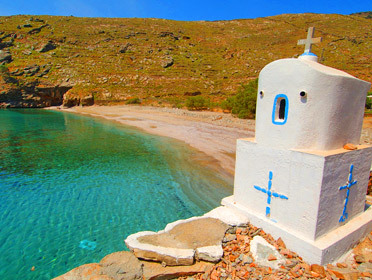 Ios, Mykonos, Paros, Kefallonia. It took me a week and several "evil" plans to convince everyone. I promised we'd only spend five days there, and then asked my aunt and uncle if they'd give us the keys to their house in Paros so we wouldn't pay for hotel rooms. Luckily, my plan worked; a few weeks later, we were traveling to Tzia. What does Tzia look like? In the last century there were a million oaks on Tzia. Many still remain, along with almond trees, carpeting the valleys and ravines. The island has a strong farming tradition: most of the villages are hillside and there's a small farming community. Tzia's landscape is actually so green that sometimes you forget you're in the Cyclades. Tzia used to be a brilliant ancient civilization and its major cities (Korissia, Ioulis and especially Karthea) left numerous remains you can still find today. Are there any places I should visit in Tzia? First of all, there's the archaeological museum. When we arrived, I actually managed to convince my friends to visit it by quoting a book that said "it doesn't contain much", leaving them with false hope that we wouldn't spend more than fifteen minutes there. But the museum houses several objects from Tzia's prehistoric and ancient sites: vessels and fragments from Cycladic figurines, inscribed steal, fragments of signs and resolutions from the Classic and Hellenistic era. Needless to say, that book I quoted? It's no longer in my library - it was ripped to shreds by Michael. Then there's th e village of Loulis. Loulis is one of the most beautiful villages in Greece, a majestic setting of hills, set against the mountain and crowned with old windmills. The houses are surrounded by orchards and gardens and its architecture is simply unique, a mix of Attica tiled roofs and Cycladic small whitewashed houses. You have to be completely numb in order to not feel the beauty of this village touching you. 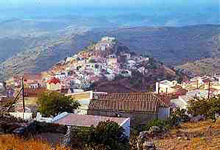 Tzia also has several monasteries and churches. 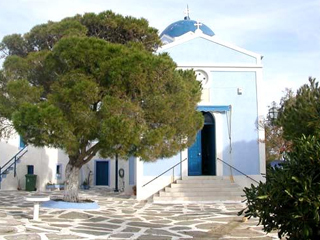 For example, there's the monastery of Kastriani, built on the site where a miraculous icon was discovered in 1700. There's the 16th-century Byzantine Monastery of Agia Anna, the romantic ruins of which are scattered around a beautiful white church. There's the church of Panagia Loutriani that's surrounded by the ruins of the ramparts of a ravine near it and, finally, there's the Monastery of Agia Marina, founded during the Ottoman occupation, rebuilt in the early 19th century and abandoned in 1837. 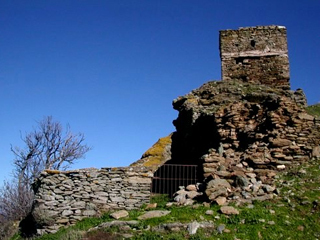 You can also find a Hellenistic town with massive dry stone walls near it. Are there any archaeological or historical sites in Tzia? 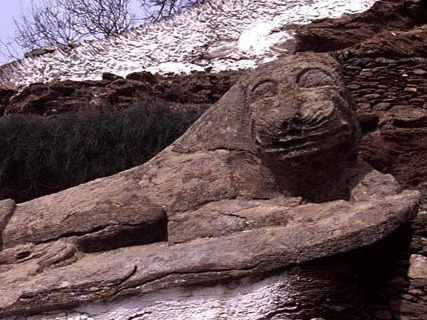 The island's most important monument has to be the Lion of Kea, a 15-minute walk northeast of Hora, carved from granite. It's probably early Archaic, or so I've read. Legend holds it represents a lion brought in to eat evil Nereids. The maneless beast is almost 6 meters long. Ancient Korissa has a few remains. The ruins of walls belong to a temple that was dedicated to Apollo. The thing that makes those ruins a must-see is the magnificent view over the bay of Agios Nikolaos. Then there's the site of Agia Irini. A thousand years of human occupation (starting in the early Cycladic Perios, 2800 BC) have left their mark and trail here. What you'll find there is a maze of crumbling walls, including a defensive wall and a palace dating from the Mycenaean Period. Don't forget to visit the ruins of the Venetian Citadel (kastro). The climb is worthwhile for the magnificent view at the top. The first time that I heard something about Tzia was that I would either love it or hate it. To be frank, now that I've been there I don't understand how it would be possible for a person to hate this place. You will definitely understand my point if you decide to visit its traditional villages. These are Tzia, Vourkari, Korissia, Milopotamos and Playa all worthwhile. 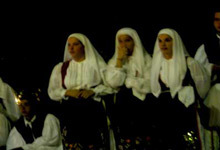 information take a look at my page Tzia Traditional Villages. If some of you came to Tzia only in order to relax, swim and sunbathe the island will not let you down. Its beaches are plenty and quite good. For more information regarding the best swimming spots such as Korissia, Gialiskari, Pisses, Koundouros, Sikamia, Kalidonihi, Agios Emilianos, Agios Filippos, Liparos and Psili Ammos. Visit my page Tzia Beaches. Where should I eat in Tzia? There are several places where you can have a decent meal in Tzia. If you decide to eat near the port a good place would be Apothiki and Lagoudera right next to it. 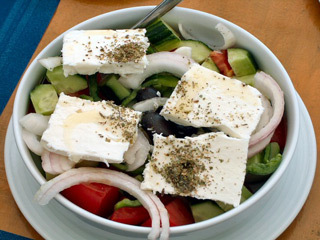 Then there's Piatsa in the entrance of Chora, Thaleia and Ennea Kores in Vourkari all serving nice traditional meals and Greek mezedes. Moving on, there's Akri, a classic taverna in Korissia near the harbor, serving fish, mezedes and cooked dishes. Lagoudera is as good as Akri, in Korissia as well. Aristos and Nikos in Vourkari are both excellent places for eating fish and lobster, but they're a bit pricy. As for Strofi tou Mimi, in Vourkari again, it serves fish and barbecued dishes in great surroundings. Finally, don't miss Yannis on the beach in Otzias (fish and mezedes), Taverna tis Annas also in Otzias and Cyxlades, the best place for home cooking. Unfortunately, Tzia is not quite big on the way of nightlife. As I said, it's a rather quiet island. The only places I can think of that you can visit are Vinillion in Vourkari, with electric music and a great atmosphere and Art Cafe or Leon in Ioulis, with techno music. How do I get to Tzia? From Athens it will take you about an hour to get to the port of Lavrio through Attiki odos. If you don't have a car you can take the KTEL buses. When you reach the port you will get the ship that passes from the northern part of Makronisos and then moves on to Tzia. The trip lasts about 60 to 70 minutes.